YOU DO NOT HAVE TO LOGIN IN TO VIEW AND SHOP OUR WEBSITE. WE APPRECIATE YOUR VISIT. We are a special group of moms who have sons and/or daughters in the military. They may be deployed, stateside or veterans; regardless, we moms come together to support each other, our military and our veterans. Dads, siblings, spouses, other family members and friends are welcome to joins us as associate members. Please take a look around our site. You will find information about our upcoming and past events as well as unique items that we sell to fund our organization. Our scheduled meetings are the 3rd Tuesday of each month. We also sponsor and attend special events to support our fundraising. One of our most well-known events is the Celebrating Freedom event held each November to honor our veterans. We also manage the Yellow Ribbon Project, a program for sending packages to our deployed soldiers. We know how stressful it can be to have your child in the military, from basic through retirement. We are available to share the experience of our mothers, and to support them through any concerns they may have. 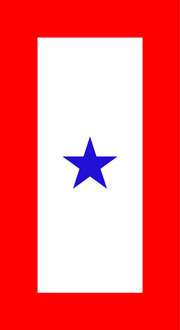 The Blue Star Flag was created in 1917 during World War I. People hung it in their windows to denote that a member of the family was serving in the armed forces. The blue star was covered by a smaller gold star if service member was killed or died on active duty. Lake Cumberland Blue Star Mothers, Inc, Kentucky Chapter 6, serves both the southeastern and southwestern counties of Kentucky.